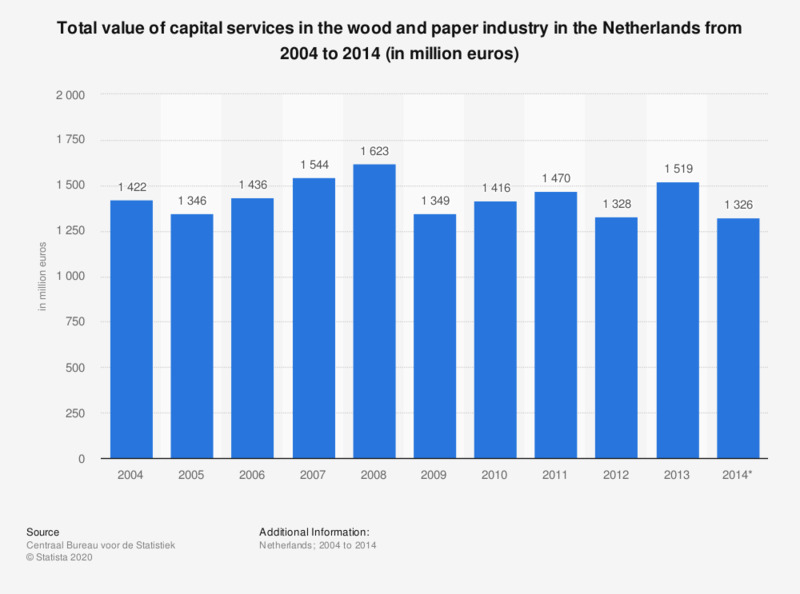 This source displays the total value of capital services in the wood and paper industry in the Netherlands from 2004 to 2014 (in million euros). Between 2004 and 2014, the total value of capital services in this sector varied between 1.3 and 1.6 billion euros roughly. The source defines capital services as: "The productive inputs, per period, that flow to production from a capital asset". The source specifies: "The most important types of capital are included in the growth accounts. The capital stocks are included, as are the oil and natural gas reserves. In addition inventories, agricultural land and land underlying buildings are included. The value of capital services is equal to the costs of capital services, these costs are known as the user costs of capital." The source states, this category includes the following sectors: "Manufacture of wood and of products of wood and cork, except furniture; manufacture of articles of straw and plaiting materials; Manufacture of paper and paper products; Printing and reproduction of recorded media".